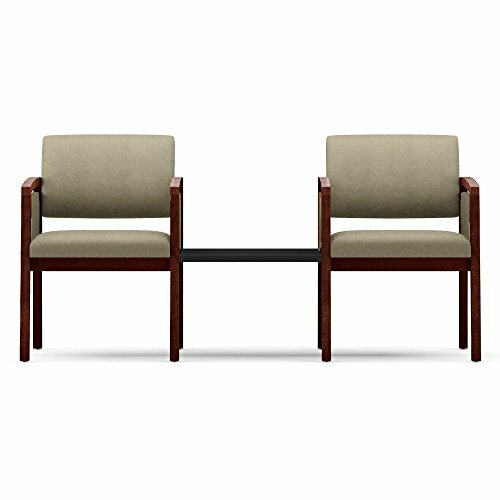 Lesro, Lenox Panel Arm Collection, Dimensions: 65"W x 26"D x 31.5"H Weight: 69 lbs. Add contemporary style to your reception area with the Lenox Panel Arm Collection. This solid wood frame two seater with center table boasts exclusive tool-free assembly system and Matrex seat suspension for lasting comfort. Two seater is upholstered in Earth-friendly, heavy-duty 100% recycled fabrics that offer exceptional wearability, withstanding 250,000 double rubs. Open back design allows easy cleaning. Each seat supports users up to 275 lbs. Ships ready to assemble. If you have any questions about this product by Lesro, contact us by completing and submitting the form below. If you are looking for a specif part number, please include it with your message.